The principles and steps for the Congress were set up at the Balkan Federation meeting in Belgrade, October 5-7, 2005 and debates followed at all the meetings until September 2006. It was at the meeting in Edirne (September 27-20, 2006) that organizing the Congress received the last approval. At that meeting ZED (PCO) considered Edirne improper for the Congress as the facilities would not satisfy. The new location was decided to be Istanbul and finally the Letter of Agreement was signed after long debates. The Congress received a good response from the country members. There were participants, it is true not in great number, from Romania, Bulgaria, Greece, Republic of Macedonia (F.Y.R.O.M. ), Serbia, Albania, Bosnia as well as from Jordan, Saudi Arabia, Syria, Kuweit, Liban, Yemen. Indeed, most of participants were from the host country, Turkey. At the official opening and in the following days, members of Turkish Parliament, Chairmen of the Agricultural Parliamentary Commision, State Secretaries on Agriculture, directors of various governmental Departments came to visit Apiexpo and meet the delegates. Most important was the presence of Apimondia President Asger Jorgensen and Secretary General, Riccardo Jannoni Sebastianini. During the discussions among beekeeping leaders, Mustafa Sarioglu, President of Turkish Beekeeping Association raised the issue of necessity to offer more protection to beekeepers and not allow traders to set up the prices for honey acquisition and other beekeeping products. He said that this would seriously harm the producers who would be deprived of resources to continue their activity. The other issue concerned joint scientific efforts to prevent the extension of Bee Colony Collapse Disorder, like in the South of United States. 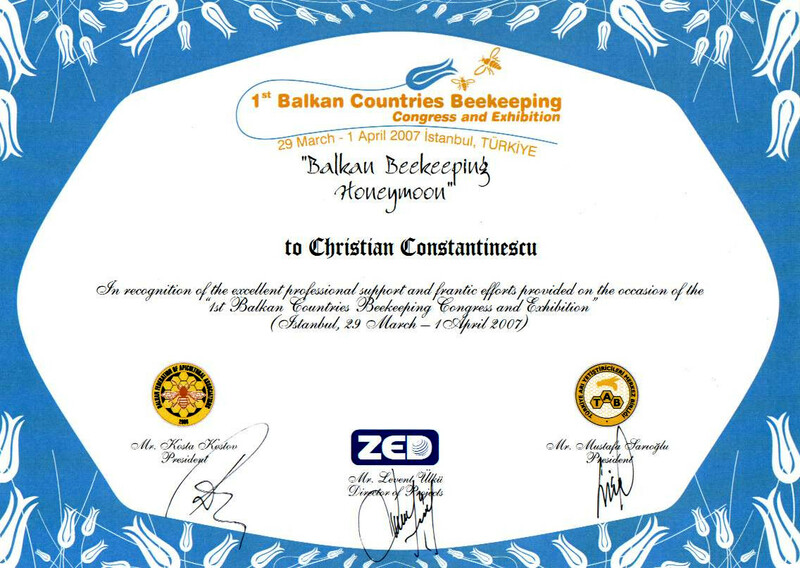 The organizers have taped the opening and plenary sessions and DVDs will be handed over to members of Balkan Federation Beekeeping Associations. Unfortunately, the taping did not include either translation of the speeches which were not in English or the "power point" scientific presentations. Asger Jorgensen, President of Apimondia, spoke highly about FIITEA major role in organizing the Congress and supported the idea of regional beekeeping organizations that can deal closer to the needs of beekeepers in the respective area. Mustafa Sarioglu, President of Turkish Central Beekeeping Association and President of Arab Beekeeping Federation has also appreciated the very good results in organizing the First Balkan Federation Beekeeping Congress and the high scientific and practical level of the presentations.